The center of Kansai (Osaka bay area) consists of three big cities, which are Kyoto, Osaka and Kobe. These three cities are in commuting distance and each city has different characters. To come to Kobe from abroad, we recommend to take a direct flight which arrives at the Osaka (Kansai) international airport (KIX) and take a limousine bus to Sannomiya (downtown of Kobe). Here are links to tourist agencies of Kobe, Osaka and Kyoto. We recommend you to make money exchanges at the airport. Rates are the same with banks in downtown. You can also make money exchanges in some banks in Sannomiya area ( google map ). Most bank ATM's will not accept your ATM card, but cashing machines of credit card companies may accept your card. (Please check on these things for your bank or card companies.) You can find cashing machines at Sannomiya area. The "Sannomiya center street" is a shoping mall with a roof. The entrace is located south of the sannomiya station and is near the building with the sign OIOI Kobe Marui. The entrance has a sign "Sannomiya center street" in English. Banks and cashing machines are near the entrance. The ATM machine at the Seven eleven (south of the No.25 building of the campus map) in the campus will accept your credit card. Japan uses AC power plugs of the type A, which is also used in US. The voltage is 100V. Most laptop computers will work with 100V, but it is hard to buy a plug converter from other types to the type A, once you have arrived in Japan. Do not forget to bring a plug converter! How to come to Kobe downtown (Sannomiya)? If you arrive at the Kansai (Osaka) international airport (KIX), take a limousine bus to Kobe (Sannomiya). The bus stops near the Sannomiya station. Please look up this for details. How to come to the conference place? ICMS2010, Kobe is going to be held in the building Z of the faculty of science (No.12 in the map), Kobe University ( Campus map ). You can come to the building Z by following the 3 steps. It will take about 30 minutes. 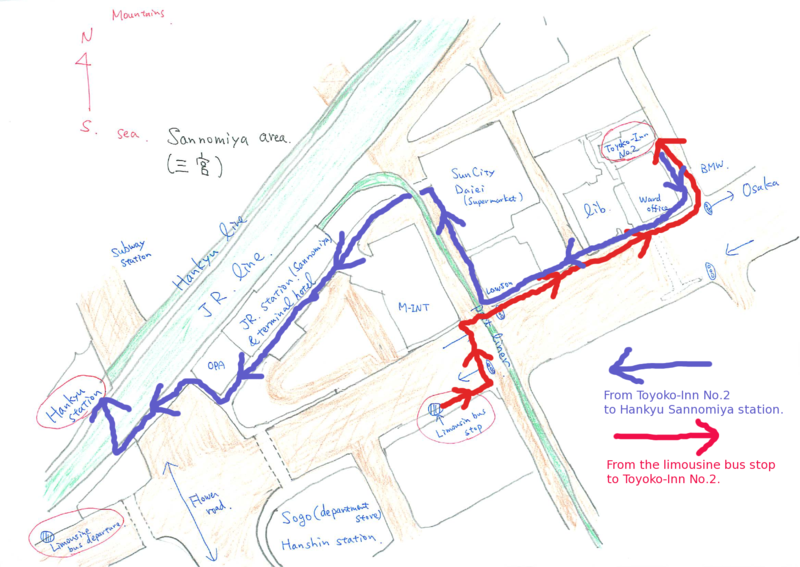 Go to the Hankyu Sannomiya station (wikipedia): map (hand written) and video ( video-qtl ) [Toyoko-Inn Sannomiya No.2->Hankyu Sannomiya station ]. Take a Hankyu local or express train (those with yellow or black destination signes) bound for Umeda (downtown Osaka) or for Nishinomiya-kitaguchi video ( video-qtl ) [Hankyu Sannomiya station -> Kasugano-michi stn -> Oji-koen stn -> Hankyu Rokko station]. The Limited express trains (with red destination signes) do not stop at Hankyu Rokko station. The ticket price is 180yen. All important signs in station are written in Japanese and English. Most ticket machines do not have English signs, but what you need to press are number buttons. Go to the Kobe University from Hankyu Rokko station by taxi or bus (No.36, 200yen) or by walk: map (hand written) and video ( video-qtl ) [from Rokko station to building Z]. When you take a bus, get off at the 3rd stop (Shindai-bunri-nougakubu mae). If you come from different places or want to know more details, please look up "Travel guide to the Department of Math., Kobe Univ." To come back to Hankyu Rokko station from the campus, we usually go by walk: video ( video-qtl ) [from building Z to Rokko station]. 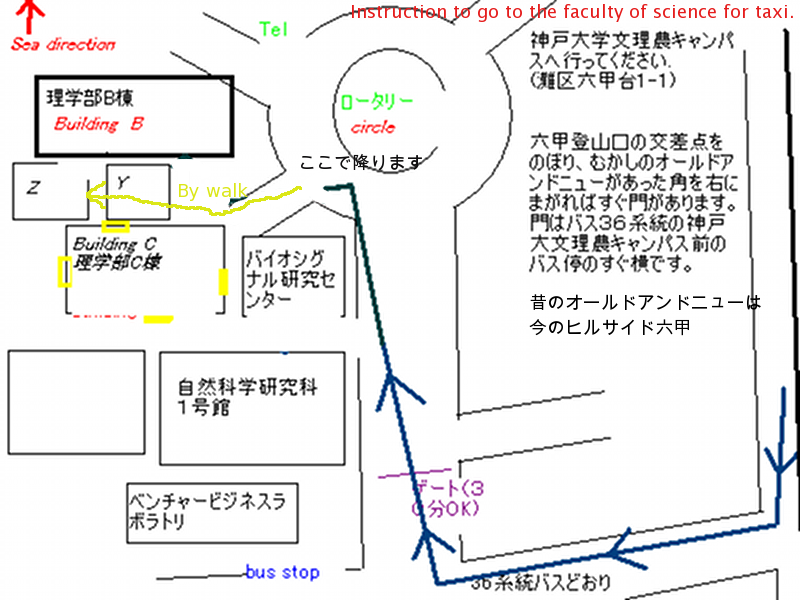 Note 1: If you firstly come to the university, we recommend to take a taxi from Hankyu Rokko station. The cost will be about 680yen (small sized car). If you share the taxi with other participants, it will be cheaper than taking a bus (200yen). 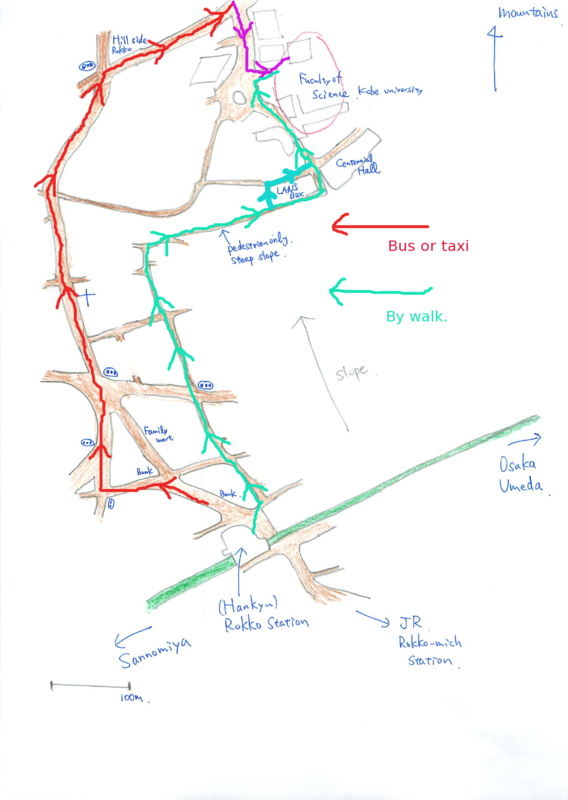 The campus is big and the taxi driver needs to know which place he should go. Show this map and instruction to the driver . Note 2: Ticket vending machines work with the order (1) insert money (2) press the ticket price or the destionation (3) issue a ticket. The order is not (2), (1), (3), which is common in Europe and in north America. Note 3: Any city bus has a money changing machine, which accept 1,000 yen bills. It does not accept 5,000 yen or 10,000 yen bills. Note 5: In order to buy a prepaid card for Hankyu lines and buses, please look up this . Download this guide, map, and movies in zip file. Q. Where can I buy an umbrella? A. You can buy a cheap umbrella at convinience stores (seven-eleven, Lauson, Family-Mart,...) or at a kiosk at train stations. The price will be less than 1,000 yen.